How Does IBM's Red Hat Acquisition Impact its 5% Dividend Yield? Can Big Blue prevent income investors from heading for the exits? Shares of IBM (NYSE:IBM) recently tumbled to a two-year low after the company announced that it would acquire enterprise software provider Red Hat (NYSE:RHT) for approximately $34 billion in cash. The deal, which values Red Hat at $190 per share, represents a premium of more than 60% over the stock's previous closing price. IBM acquired Red Hat to strengthen its cloud business, one of the key "strategic imperatives" (cloud, analytics, mobile, security, and social) which Big Blue is trying to grow to offset the weakness of its legacy businesses. The decision comes less than two weeks after IBM disappointed investors with a mixed third quarter report that snapped its brief streak of sales growth with a 2% year-over-year decline. IBM claims that the massive deal, which is expected to close in the second half of 2019, will boost its revenue growth, gross margin, and free cash flow (FCF) within 12 months of closing, and will support the continued growth of its dividend. That outlook sounds confident, but investors aren't thrilled with IBM's decision to pay $34 billion for a company that generated just $2.9 billion in revenues and $540 million in non-GAAP net income last year. Some investors are also likely questioning IBM's ability to support its forward dividend yield of 5% as it integrates Red Hat into its hybrid cloud unit. Let's take a closer look at IBM's dividend to see how it could be affected by the Red Hat deal. How sustainable is IBM's dividend? 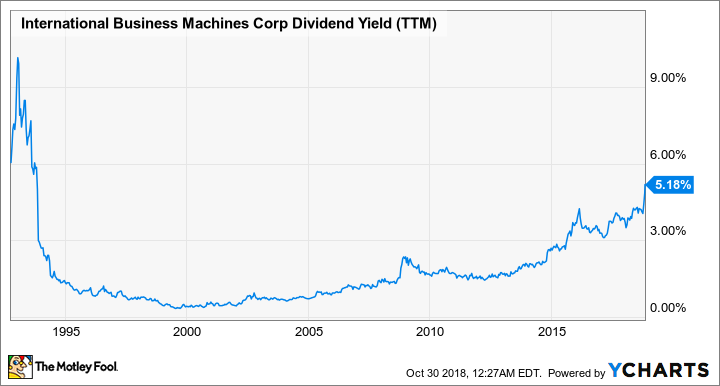 IBM raised its dividend annually for 23 straight years, so it could soon join the elite group of S&P 500 "dividend aristocrats", companies that have hiked their payouts for over 25 consecutive years. IBM's current yield of 5% represents its highest yield since the early 1990s. IBM spent 99% of its earnings on dividends over the past 12 months. That figure looks lofty, but that payout only used up 44% of the company's FCF -- which indicates that IBM has room for future hikes. IBM also spent 24% of its FCF on buybacks during that period. 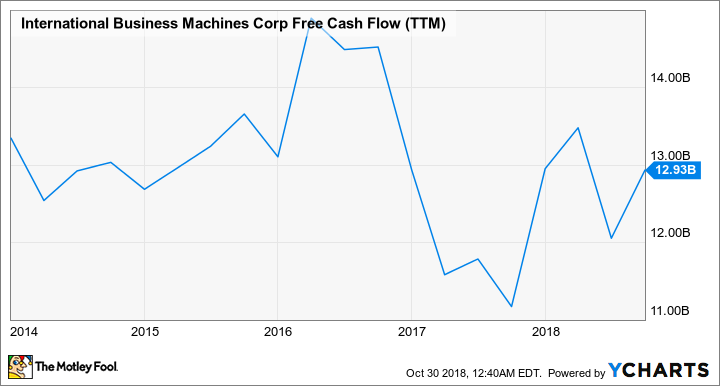 But here's the problem: IBM's FCF growth has been unpredictable over the past five years due to a streak of divestments and acquisitions aimed at boosting its sales growth. IBM finished last quarter with $14.7 billion in cash and marketable securities and $46.9 billion in debt ($10.9 billion in short-term debt and $36 billion in long-term debt). IBM plans to fund the Red Hat acquisition with a mix of cash and debt, which will boost its debt levels as interest rates rise. IBM doesn't expect the purchase to be accretive to its operating EPS until the second year after closing. In other words, the Red Hat acquisition will likely cause IBM's earnings-based payout ratio to climb above 100%, but its FCF payout ratio should remain well below that threshold, even as its FCF growth dips. IBM also plans to suspend its share buybacks in 2020 and 2021 to shield its dividend and reduce its debt-to-equity levels. Therefore, it's safe to say that IBM should be able to keep raising its dividend for the foreseeable future. But is the yield worth the pain? Investors looking at IBM's 5% yield and forward P/E of 9 might assume that it's an undervalued income stock. But Big Blue is cheap for a reason: The growth of its strategic imperatives is slowing down, with its widely hyped Cognitive Solutions and Technology Services & Cloud Platforms units generating anemic growth amid tough competition from market leaders like Amazon and Microsoft. Absorbing Red Hat, which is expected to post 15%-16% sales growth over the next two years, might alleviate some of that pain. But many analysts and former IBM employees claim that Big Blue is still plagued by operating inefficiencies, low morale, and management problems that can't be resolved by massive shopping sprees. IBM expects the Red Hat purchase to boost its revenue by a five-year CAGR of 200 basis points. That sounds decent, but it could be easily offset by IBM's ongoing problems in its existing businesses. And with plenty of other high-yielders sitting near 52-week lows, IBM's 5% yield might not be worth the pain.